BC’s new climate plan, Clean BC, is a big and visionary document and was instantly lauded by environmental groups and businesses alike. In this post, I recap the key components of the plan and do a bit of a reality check against the hype, in particular the challenge of fitting liquefied natural gas (LNG) into the plan. It was a decade ago that the BC government tabled its first comprehensive plan to reduce provincial greenhouse gas (GHG) emissions, with its signature policy move of introducing the first broad-based carbon tax in North America. In 2008, BC could legitimately claim to be a leader in climate policy and the plan received awards and praise from outside the province. However, the provincial government largely lost interest as the years passed (I recap that early history here). In the aftermath of the 2015 Paris Agreement, the Christy Clark government issued a new climate “leadership” plan, but it was mostly smoke and mirrors and was widely condemned by climate policy watchers (see our analysis here and here). The ongoing challenge for the Paris Agreement is that the commitments made by signatory nations are not sufficient to meet the Agreement’s ambition to keep global warming under 2°C, much less its more aspirational target of a 1.5°C ceiling. Canada’s federal and provincial governments have put forward a Pan-Canadian Framework on Clean Growth and Climate Change, but it is not enough to meet Canada’s own inadequate Paris target (see this post) while some provinces like Ontario are actively backtracking from previous commitments. With foot-dragging the order of the day, BC has an opportunity to reclaim the mantle of leadership. Over the past year, the new BC government increased the province’s carbon tax (with three more years of increases to come) and improved the carbon tax credit to low-income households. 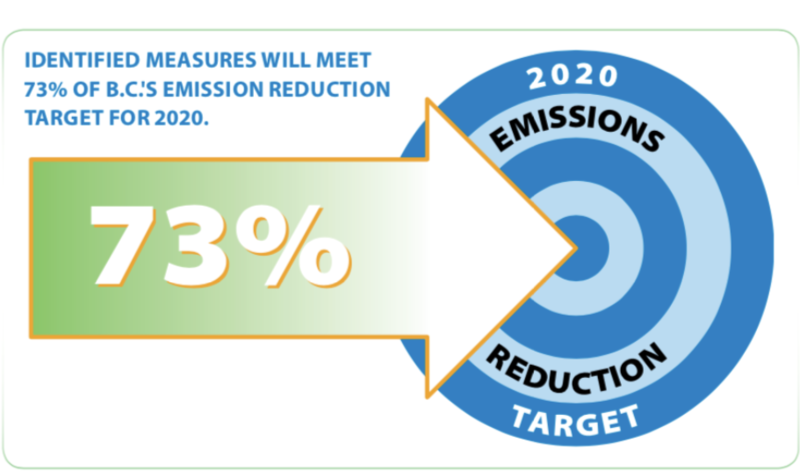 Recognizing that the previous target of a 33% reduction in emissions by 2020 would not be met, the government passed new legislated targets of a 40% reduction by 2030 and 60% by 2040 while keeping the previous long-term target of 80% by 2050 (all relative to 2007 levels). BC’s new climate plan is a major step forward and much of it is consistent with notions of climate justice that we and others have been developing over the past decade. At a high level, our Climate Justice Project has long called for a plan that integrates climate, employment and industrial policies into a coherent economic development strategy for the province. This bold and visionary thinking is central to the new plan and its branding as Clean BC. Transportation: A push towards zero-emission passenger vehicles (ZEV) with a requirement that 10% of new vehicles sold in 2025 be zero-emission, rising to 30% in 2030 and as of 2040 all new passenger vehicles would be ZEV. The government will also subsidize the cost of new zero-emission vehicles and expand electric charging infrastructure. In the short term, BC will tighten up its low-carbon fuel standard and increase the production of biofuels. Buildings: All new buildings will be mandated to be 80% more energy efficient—“net zero ready”—by 2032, meaning their annual energy needs, on average, could be met by rooftop solar panels. Existing buildings will be retrofitted through subsidies from the newly minted Efficiency BC program, and in particular, BC’s stock of social housing will be upgraded. A minimum requirement of 15% renewable gas (captured from landfills and agriculture) for buildings will be implemented. Industry: New carbon tax revenues from industry (that portion above $30 per tonne) will be used as an incentive to reward the lowest GHG performers. New regulations to reduce methane leakages will be implemented and electrification is the order of the day for large industry. This piece is the most challenging and I will come back to the thorny issue of gas development and LNG below. Not all of these measure are new policy (e.g., the “net zero” buildings) and some measures only come into effect well into the future (e.g., the ZEV mandate). To some extent the plan reads as if we have the luxury of decades to slowly make our energy transition. Still, it is important to have a vision of a low-carbon BC in which different sectors of society can imagine themselves. In terms of climate justice, there is a lot in the plan for workers. For example, there is an explicit focus on skills development for assessing energy efficiency in buildings and training for work related to zero-emission vehicles. A Labour Readiness Plan will seek to bridge supply and demand of skilled workers. It is important to have a vision of a low-carbon BC. The measures contained in the plan will be funded in the 2019 BC Budget, although we will have to wait until February for full costing in many cases. There do not appear to be any gimmicks, like using carbon offsets to meet targets, as was the case when the Clark government claimed to have met its 2010 interim GHG target through carbon offset purchases (for which the Auditor General challenged their credibility in a scathing 2013 report). Similarly, the government isn’t claiming to use reforestation as a replacement for lowering emissions as Premier Clark did two years ago. Importantly, we were looking for the plan to include mechanisms for independent oversight and accountability to ensure the Province stays on track. The new measures include stronger annual reporting and forecasting of emissions and the existing Climate Solutions and Clean Growth Advisory Council will provide independent assessments. These are positive developments although they are still far from the type of formal carbon budgeting approach we see in the United Kingdom (see this post for an overview). Ultimately, the new climate plan does not have enough measures to meet BC’s legislated 2030 target (the 2040 and 2050 targets are not discussed). The government claims that the plan gets us 75% of the way to our 2030 target and promises that future measures to close the gap will be delivered in the next 18 to 24 months. By the time those new measures are legislated, regulated or otherwise implemented, however, we will already be bearing down on 2030. Does this 75% claim have any credibility? If we turn back the clock a decade, essentially the same claim was made about the commitment in BC’s 2008 Climate Action Plan to reduce 2020 emissions to 33% below 2007 levels. At the time, the government created a Climate Action Team to advise how to close the remaining gap, but its recommendations were never fully implemented. As of 2016, the most recent year for which data is available, BC’s GHG emissions (excluding forests and land use changes) were down just over 3%. Relative to 2016’s 60.1 million tonnes (Mt) of carbon dioxide equivalent emissions, the new plan lays out an estimated 18.9 Mt of emission reductions, which would be a significant achievement. Much of the focus is on personal or household emissions from housing and transportation, which account for 2 Mt and 6 Mt of emission reductions respectively. But industry is responsible for the largest share of emissions (about 70% of the total including commercial spaces and office buildings). Another 1.8 Mt of emission reductions is estimated to come from the increase in the carbon tax to $50 per tonne in 2021. This seems a stretch given that this increase is small—equivalent to about 4.4 cents per litre of gasoline at the pump. Modelling industrial emission reductions is more challenging, in particular given the high level at which those policy measures have been detailed and that is where I’m skeptical of some of the plan’s numbers. Some 8.4 Mt of reductions are claimed, but the government has not shown its math on this nor does it break down how emission reductions would be achieved in different industrial sectors (forestry, mining, construction, etc.). For large industrial emitters, carbon taxes above $30 per tonne will flow back to specific companies that meet a world-class standard. How this will translate into 2.5 Mt of emission reductions is not obvious. Similarly, some 0.6 Mt of reductions are estimated to occur through carbon capture and storage. Industrial electrification is a big part of the story—an estimated 3.5 Mt of reductions—and this leads to the most challenging aspect of the plan: LNG and the expansion of the oil and gas industry. In the lead-up to releasing Clean BC, the government repeatedly stated that LNG would fit into the new climate plan. But as the 75% number tells us, it does not. It’s striking to me that the decision to approve LNG Canada was made at a time when the government knew it did not have enough measures in hand to meet its legislated 2030 target. As I have commented previously, short-term politics trumps good climate policy. BC needs to find an additional 6 Mt of reductions to meet its 2030 target and must do so within two years. The government estimates that Phase One of LNG Canada’s north coast facility plus upstream impacts will add 3.5 Mt once built out. Again, they have not shown their math and based on work by the Pembina Institute and earth scientist David Hughes the range is more like 5–6 Mt for Phase One. More than one-fifth of BC’s total emissions are from the oil and gas industry, but rather than beginning to slowly wind down fossil fuel production, the government’s objective is to increase production while powering upstream fracking and processing with clean electricity. This electricity will come from the Site C dam, which poses a range of environmental challenges including GHG emissions associated with construction and flooding of land. Electrification of gas production constitutes the bulk of the difference between their 3.5 Mt estimate and our larger range. None of this gets around the fact that every unit of gas “saved” through reduced methane leakages and the use of electricity in production is another unit that can exported and burned elsewhere. An important question is how much this will cost. Stringing wires to every oil and gas extraction and processing site in the province is not particularly efficient. Already, electrification has been facilitated by the Dawson Creek/Chetwynd Area Transmission Project at a cost of $300 million. This cost is only partially being paid by the industry it serves. Instead, those costs will be spread across all ratepayers, including residential and commercial customers through higher BC Hydro rates. Short-term politics trumps good climate policy. A new transmission line called the Peace Region Electricity Supply (PRES) project will connect Site C to gas fracking and processing operations. Cost is not stated but it is also likely to be in the hundreds of millions of dollars, which will again be spread across all BC ratepayers. This is somewhat ironic because “focus on affordability” is one of the headings in the document. Also related to LNG development are the upstream leakages of methane, a very potent greenhouse gas and the principal component of fracked gas. In recent years, the BC and federal governments have promised a 40–45% reduction in methane emissions by 2025. The tricky part is that BC is only just starting to get a handle on how large those emissions actually are and historically has simply relied on what industry tells them. Field studies suggest methane emissions are much higher than those reported. It is possible that LNG Canada can be made to fit within BC’s 2030 targets if enough additional emission reductions can be found in the next 18–24 months. The Clean BC report has a reasonable discussion of where it will be looking for additional measures to get another 6 Mt of reductions. But locked-in emissions from LNG Canada will make it extremely difficult, if not impossible, for BC to meet its 2040 and 2050 targets of 60% and 80% emission reductions. Minimally, LNG Canada’s emissions would comprise a very large share of what’s allowed in each of those years. The flip side is that the Clean BC plan makes it very hard for LNG Canada to justify its Phase Two, which would double export capacity. LNG Canada would have to move strictly to electric drives to power the Phase Two plant, along with little or no incremental upstream emissions. Not counted in the provincial GHG inventory, and excluded from the targets and timelines, are the emissions from fossil fuels extracted in BC and combusted elsewhere. Thus, we aspire to reduce emissions within our own borders while simultaneously increasing our exports of fossil fuels. And the combustion emissions associated with those exports are massive: about 32 Mt emitted in Asia would originate from BC soil (Phase One only). BC is a wealthy jurisdiction with a relatively small population and abundant resources, including hydroelectric power that gives the province a huge leg up on other jurisdictions. With such advantages, if anywhere can make the leap to zero carbon it ought to be BC. The vision set out in Clean BC is a compelling one as long as you squint to ignore BC’s projected surge in fracking and LNG exports. Unfortunately, the plan reflects “all of the above” thinking that says yes to everything: new green industries and technologies AND more fossil fuel development. This makes getting to BC’s 2030 target much harder and jeopardizes the likelihood of achieving the 2040 and 2050 targets. That said, climate policy is a challenging file that runs the risk of alienating industry and stoking fear in the hearts of workers while never being enough to satisfy climate hawks. The BC government has clearly played the politics of climate action well, having signed a Memorandum of Understanding with the BC Business Council and achieving endorsements from some prominent environmental NGOs along with support from the Green Party and its leader, climate scientist Andrew Weaver. Clean BC is progress but it is also a work in progress. Time will tell whether the new plan can stay on track, or if, like its predecessors it will fall by the wayside in spite of its good intentions.